Pediatric Dentistry for Minneapolis Provides Safe X-rays! Low dose digital x-rays are just one more example of Serene Dental Oaks commitment to bringing the best in pediatric dentistry to Minneapolis families. Children are highly susceptible to cavities for numerous reasons. The enamel on their teeth is much thinner than on adults, meaning cavities can enlarge quicker. And let’s be honest, they’re more apt to fall asleep without having properly brushed and flossed, perhaps even with a candy from Grandpa in their cheek! Without X-rays, a dentist can only see half the picture. 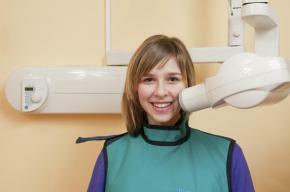 Cavities can easily be forming unseen between teeth, but an x-ray will illuminate them. They also enlighten the dentist to what’s happening beneath the gum line. X-rays are capable of showing both the baby teeth and new permanent teeth still forming. An evaluation can then be formed regarding whether proper development is occurring. You’ll be happy to know that Dr. Horn has invested in the newest improvement for dental diagnostic imaging. Now your child can have their dental x-rays done electronically, with the image appearing almost instantly on the computer screen. The best part is these digital x-rays use about 80% less radiation than traditional x-rays! Don’t dismiss the importance of preserving the health of your child’s baby teeth! They’re important for not only chewing, but also speech, and holding the place for future permanent teeth, enabling them to emerge on time and in position. Schedule a dental check-up today with our dedicated pediatric dentistry experts for Minneapolis and area! Keeping your child’s smile happy is priceless!